So, there's good news and there's bad news. The good news is that America's favorite sporting rifle was not involved in the latest school shooting in Santa Fe, Texas. The bad news is that there is now an even bigger spotlight on other types of guns, as the gun grabbers realize that what we've been saying all along about there being other weapons, is true. When used at closer ranges, the average bird-hunting shotgun is actually more deadly than the much-vilified AR-15, said Dudley Brown, president of the National Association for Gun Rights. Banning AR-15s will do nothing to stop disturbed and deranged shooters. While I understand what he's saying, what do you think the gun grabbers will go after next? 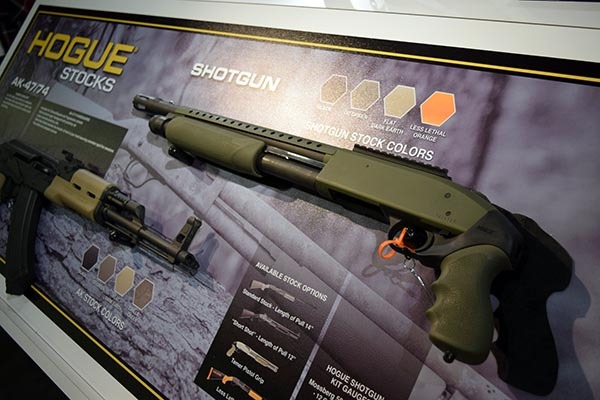 Would it be the “average bird hunting shotgun?” Or, would it be semi-auto handguns? Revolvers? Does the end justify the means if all we're doing is hurting our chances for the long haul? I mean, we keep pointing out that other guns are just as deadly as the AR-15. Don't we? What's next? Bolt actions? Some properly trained folks are much more dangerous with a scoped Remington 700 than they are with an AR-15, so let's not ban the AR-15! When you look at statements like those with a set of fresh eyes, even if they are true (because they are), all we're doing is setting ourselves up for failure later on down the line. Then when they ask what to do instead, we say: Instead of disarming the people who are both willing and able to defend the lives of children in school, let's give them the ability to do something when an active shooter situation happens. Let's give them guns and the training they need to defend themselves and their students. I'm not talking about a class off school property. I mean, the shooting portion should take place at an actual gun range, sure. But, what about how to handle an actual situation? How about how to defend from certain positions within the school? How to handle bottlenecks? What should the teachers who are not armed, do? So on, and so forth. There are things we can do outside an outright gun ban, even though that's the only thing our opposition wants to talk about, which will not work. Then, once that doesn't work because clearly shotguns and handguns can be used, as well, they'll come for those next. Let's stop arming our opposition with ammunition for their end game and beef up our offensive right now with knowledge and saying things that are actually a solution. There are things we can do that won't erode our freedoms as American citizens that will work. What a shame that they won't listen to us. To arm willing, well-trained school personnel is the answer even if the anti-gunners won't admit it. As far as I can see, it's the only course of action, and the only way forward that will work and not take away our rights at the same time. I agree that something has to be done. We need to stop psychos from killing innocent kids. But, taking away our rights is NOT the answer. Arming people who are willing and able, is. Did I leave anything out? Do you have any suggestions? Let me know in the comments, below. All true, but the point is that the gun grabbers don’t really care about what will actually work. They simply want to ban all guns. If they did actually care, they would be willing to point out the many times that someone actually stopped an active shooter with a gun, but they will never do that because they will have to admit that guns can be beneficial. They will never do that. How many people knew that a citizen with an AR-15 stopped the shooter of the Texas church shooting? Not many, because the media only wants guns portrayed as evil all the time, never mind the facts. I believe that there are multiple politicians just sitting around thinking up different ways to’ “infringe” on our 2nd amendment rights. Ban magazines, apply more fees, ban or limit purchasing ammo, limit the guns a person can buy, making ridiculous laws that do nothing to stop a shooter that cares nothing about the law, hence the word criminal. They know that it does nothing that will affect the criminal, so what they will do is make laws that create criminals out of law-abiding citizens and take their guns. They will never stop until they accomplish that. I have a friend who’s a high school teacher, extremely liberal. He spouts the only way to end the problem with the school shootings is to make each and every person in the U.S. turn in their weapons. I can’t get him to realize that banning weapons will not clear our country of firearms, all it will do is take them out of the hands of the good guys. But he insists that he and his other liberal friends will not compromise on this issue, and will only accept complete confiscation of all firearms. Typical mindset of the anti-gunners. On the topic of arming some of the staff and teachers, he is adamant that if we arm a select group of teachers, they will end up shooting each other or themselves, but will be ineffective against any school shootings. His is the common liberal mindset, and there is no changing his mind. We gun owners need to stand strong and vigilant. The liberals are dead set in their ways, and will stop at nothing short of total confiscation. We need only look at the history of other nations to see what a mistake this would be. Thanks to groups like Concealed Carry who help us carry the torch. I agree with you. Instead of banning any firearms look at the problem first. Kids need to be taught in school about firearms, and what they can do. Also educate them on was to avoid being a target in the classroom. I put a lot of the blame on certain tv shows, movies, and video games. Plus you have the ones that get bullied at school seeking revenge on those that bully them. When I was young we fought it out on the playground. When I was in Junior High our principal had a different way of setting things. Boxing Gloves! He would take us to the gym to duke it out. When both were ready to give it up he’d stop the fight, and had us shake hands afterwards. That settled a lot back then. I stand with the second amendment and the N R A the gun grabbers are payed off to raise cain and they need to get over it we will not give up our right to defend ourselves and our family. I’ve been saying all along to friends and family as well as others that guns isn’t the problem. Other weapons can be used to kill that the problem is the individuals that commit these treacherous acts of deadly violence. What you have been saying about other guns just made a deeper hole for you to work to climb out of you need to think a little bit more broadmindedly and think of the worse case scenarios of all firearms and how to protect those rights when something happens. As I read about the shootings throughout our nation it sickens me. However these killings come from people who have no respect for life itself. As these crimes are being committed the people against firearms scream louder and we law abiding Americans who use our weapons for hunting target shooting or completion are the ones who are being punished. Most of the law abiding citizens who own guns are not going to say much because they are not the ones who are all worked up it is the people who don’t realize problem kill people not the guns. I myself have a coneaed weapons permit and carry everywhere I go except for work. I feel that the way the world is today you almost have to and I do more to protect my family. Do not punish the law abiding citizens for those who kill it should be an Eye for an Eye, for the public to see. Look at the Middle Eastern countries which I do agree with all of their ways but their crime rate is low. Why??? Because it is an Eye for an Eye. We must hold our ground and stand for what this great nation has given us the right to bear arms the right to protect our Love Ones. The next time there is a shooting of any kind and of the person is guilty spend that dollar and excute them. This will make more people think before they act. Criminals will be Criminals do not punish us law abiding citizens for their actions. I agree to having people who are well trained in the ability to use a firearm to protect our school children , in all levels of school, is a great idea. Now we have to convince the Godless anti-gun activists on board with it. When they took God out of the schools is when they allowed Satan to get his foot in the schools. This is why there are so much psychotic behaviour in the school system. We also need to get the school board system free of the greedy people that only care about the lining of their pockets and replace them with God fearing folks who care more for our children and their safety. We’ve always had firearms (and AR-15s for over 50 years), but only recently have we had school shootings. So, what has changed? THAT is the question we should pose to the anti-gun fools. When that question is answered, we have a view of the solution. I think you are dead on give those teachers that are not afraid to carry training on “active shooter” allowing them to defend or terminate the problem. It just makes for a perfect solution. The minute the shooter opens the class room door blast him. End of bad guy These fools have to be insane at best to throw their life in the toilet and take out a bunch of innocent people. Sad this is what our society has become. Seems like all class room doors should be able to be locked. As I recall those doors are solid core doors. Locking the doors to the outside with a buzzer box for entry. My Grandson has this at his school. Hit the buzzer state your business and they will buzz you in. A shooter would have to break the glass to gain entry giving the front office time to sound the alarm anything to delay the shooter is a bonus. Lock down all doors locked it may not be much but the more time it takes for the shooter to gain entry any where slows him down is still a bonus. Didn’t mean to get so winded Banning guns so not the answer when the bad guys will have them anyway. Dudley Brown and his organization is a scam anyway. Research him and his NAGR. He is a poor representative for gun owners. He’s a opportunist. While I cannot confirm nor deny his validity to our cause, I know I’ve heard plenty of gun owners saying the same thing. Sometimes on social media, sometimes in the local gun store, sometimes at the range. Either way, I’m a firm believer that all we’re doing is giving them ammunition for later on down the road. I will take the time to research him and the NAGR a bit more, thanks for pointing it out. Who knows, maybe I’ll write up a piece comparing all the gun organizations out there, listing them based on what they’re offering and what they do. There is always one question that always enters my mind with each and every sad event when kids get their hands on their parent’s firearms. How did they get their hands on the firearms used? My children, now adults, even to this day cannot gain access to my firearms. There is no chance of any child accidentally finding them either as my home protection pistols are all in a rapid fingerprint access safe, my long guns in other secure safe. I once was at an open house with kids in attendance where I discovered a loaded firearm on the nightstand. I immediately notified the owner, demanding he remove and put it in the safe in his bathroom. That was an unacceptable incident! I have great kids who could NEVER contemplate using a firearm on innocent, unarmed, non threatening individuals. They have been trained in absolute gun safety without incident. They are responsible adults now and still do not have access to my firearms. Come on, fellow firearms owners. Let’s get a handle on this or face the consequences of loosing our right to RESPONSIBLY own firearms! I’m a former teacher and I can say, without equivocation, that a few trained and armed teachers and staff on every faculty is the key to school security. It’s only common sense.